What Are Conflict Resolution Careers? It sounds funny that conflict resolution is a legitimate career path. Isn't conflict resolution just another way of saying "solving arguments" or something to that effect? But it is actually big business and a rapidly expanding professional field, especially on a macro-level. There are literally dozens of professional organizations around the globe dedicated to conflict resolution, dispute resolution or mediation and its legitimacy as a standalone field has grown rapidly since the turn of the century. 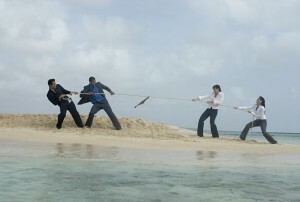 Sometimes called alternative dispute resolution, conflict management helps bring together people who are at odds. The goal is to have them look at both sides of an argument and reach a level of consensus without resorting to litigation. Finding common ground is difficult and takes a very special set of skills. Conflict resolution mediators help parties assess their current positions and help them decide a mutually advantageous outcome to the disagreement. Individuals and groups have been using arbitrators, third-party neutrals and mediators for decades, especially in union negotiations with management. Over the last 20 years there has been a major increase in the use of neutral arbitrators for a variety of disputes in the workplace and in the community. Why Do We Need Conflict Resolution Careers? Gather people together and you will have disputes. It seems to be part of the human condition. As life gets more litigious and complex, the need for people to work in conflict management keeps growing. In the legal field, mediators reduce the cost and time involved in going to trial, especially with family and divorce issues. Mediators in Human Resources help businesses resolve problems with employees. Arbitrators help union and management reach an agreement and avoid a strike. Corporations, schools, government agencies and community groups use them to reach consensus more quickly, before problems escalate. What Are the Education Requirements to Become a Conflict Resolution Mediator? Unlike some counseling-related careers, states have not yet written specific legislation pertaining to the conflict resolution career field, thus, there is no minimum threshold of education that an aspiring mediator must achieve. That said, almost all job specialties in conflict resolution require at least a Bachelor’s degree. Some universities such as George Mason University in Virginia, American University in D.C. and Creighton University in Nebraska, offer specific degrees in Conflict Resolution and Mediation. But when it comes to undergraduate degrees, subjects such as business, public administration, social science or judicial administration all overlap with the field. There are no set education standards or federal licensing, though individual states may set their own training requirements. Many schools offer conflict resolution training. For example, the Scheinman Institute on Conflict Resolution at Cornell University, has professional programs and certificate programs. A number of universities, such as Columbia University and the University of Oregon offer specific Master’s degrees and graduate certification for the profession. In many cases, an internship is required. Many in the field join one of the professional organizations like the Association of Conflict Resolution or the American Arbitration Association, which provide ongoing classes. There are also organizations like the International Mediation Institute that have created what they call "global professional standards" with the idea of creating universal guidelines for quality in the field. Read more about conflict resolution degrees. What Does a Conflict Resolution Mediator Do? Conflict resolution involves a wide variety of arenas. If people or groups are in conflict and can’t find a way out, the mediator helps them come to an agreement. That makes the field relevant in numerous settings. The mediator is also called an arbitrator, conciliator, facilitator or ombudsman, depending on the setting and the circumstances. Though the people and settings vary, all need certain important skills. They must have trained and finely tuned critical reasoning expertise, reflective listening, emotional detachment, the ability to get along with people from diverse backgrounds and with a range of personalities, and know how to organize groups and help with decision making. According to the American Arbitration Association, arbitrators manage cases from filing through closing. They set up hearings and provide interested parties with information about how to settle disputes. They can create systems for corporations, law firms, courts, unions and agencies to help them resolve conflicts. Where Does a Conflict Resolution Mediator Work? Conflict resolution mediators work in many settings, usually indoors in an office setting. It is common to gather the opposing sides around a table to discuss issues. Mediators also meet one-on-one with individuals involved in the dispute. These meetings can take place at the court, at a business, hospital, attorney’s office, community group meeting, government office, union office, community hall or off-site in a neutral setting. Learn about other counseling careers. What Is the Annual Average Salary of a Conflict Resolution Mediator? The industry is established enough to be recognized by the United States Bureau of Labor Statistics as well. According to the BLS, group arbitrators, mediators and conciliators earn an average of $69,060 a year as of May 2015 and the top 10 percent of the profession can earn almost $120,000. But this can vary substantially depending on the specialty. For example, those in finance and insurance earned over $63,000, while those in religious, civic and grant-making earned a little over $46,000. Scott, Vivian (2009). Conflict Resolution at Work for Dummies. For Dummies Press. Mosten, Forrest S. (2001). Mediation Career Guide. Jossey-Bass Press.